This adult Green Heron was carefully supervising her young while it was learning to hunt. Her perch is the roots of the water lily plant called Spatterdock, they get absolutely huge. 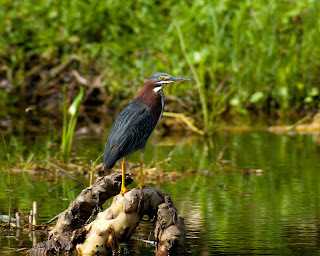 The Venetian Gardens in Leesburg, where this was taken, are doing a major cleanup of the waterways and it is rapidly turning into an exceptional spot for viewing birds of all kinds, along with otters and gators.